I hope you had a great weekend! I enjoyed watching the Masters (golf) yesterday. Anyone else? And, I watched two movies - A Star is Born and Second Act. Honestly, I did not really enjoy A Start is Born. Everyone seemed to love it - but I was bored from the beginning - and I just did not enjoy it. Second Act was predictable - but a feel good - fun movie. As far as the spring outfits above - I actually styled four years ago! I have found as similar of items I could (if the item was no longer available). 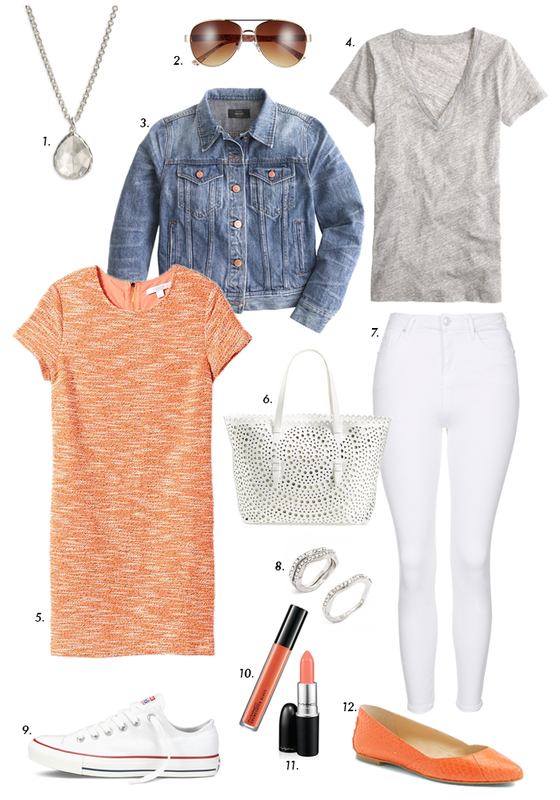 But with coral being one of the colors of the year - and spring weather - I liked the combo of white jeans, grey tee and coral. This floral wrap dress for $25. These comfy slip on sneakers for 50% off. This bell sleeve chambray top on sale. I love this classic white blazer with a more cropped fit. This white eyelet top is only $17. This floral tie front blouse is 50% off. This tunic sweater is on sale for $8. This new arrival floral sweatshirt. This $20 camo sweatshirt looks cute layered with a chambray shirt. These suede ankle booties for 50% off - in blush, black and off white. This long cardigan for 50% off. This off the shoulder floral dress for $25. This workout sweatshirt jacket for 50% off. Great color combination! I don't own a lot of grey for warmer weather months, not sure why?! This is great inspiration! I used to have coral shoes that I wore ALL of the time! Such a perfect pop of color. I think I need a new pair!